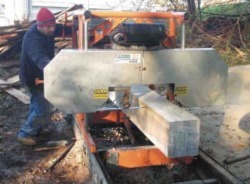 "a Saw and a Song"- Dave Boyt, Independent Sawmill & Woodlot Management, April 2012 Issue. What sawyer hasn’t looked at a spectacular board and thought about using it to build a piece of custom furniture (before cutting it up for pallet lumber)? And what woodworker hasn’t dreamed of getting the first pickings off the best logs from the sawmill or selecting the logs for a project and determining how the log is cut? He recognized that it would be a challenge to build a cabinet business in the heart of Amish country, where generations of woodworkers were already established. “Initially, my niche was unclear. I could only hope my strong work ethic, background in personal service, and attention to detail would give me the edge needed to succeed.” He now builds high-end cabinetry, custom built-ins, conference tables, and commercial desks. Over the years, he has accumulated tools that have enabled him to move into his niche, including a restored 1908 vintage, 16-inchOliver face planer that’s just a few feet away from a new, top-end Delta table saw. Even with the right tools, finding quality lumber was a real issue for Duane. “I’m really picky about using only top-notch lumber for my projects, and was frustrated because I could not find the quality of wood that my customers and I expect,” he recalled. “Many times I would travel to a supplier only to find the best lumber had already been picked out of the pile.” The solution was all around him. Central hardwood trees, sycamore, maple, walnut, oak, cherry, and yellow poplar were being cleared for roads and housing, or had blown down and were being cut up for firewood. While there were not enough of these trees to interest large sawmills, Duane decided that he could make use of them. Milling his own lumber has had other advantages for Duane. He says he likes the fact that he no longer relies on outside suppliers. Milling allows him to cut the lumber for specific projects For example, when building a corporate conference table, he knows the dimensions of lumber he needs for each part, and where the best grain patterns should appear. He then cuts the log accordingly. Keeping the boards in sequence, he can book-match tabletops, match parts for grain and color, and even cut his own veneer for panels all from the same log. An unexpected niche for Duane comes from the desire of some of his clients to have trees from their own property turned into furniture. He notes that one family eats at a table he built from a tree that had been removed because it was leaning over the house. When a customer has specific ideas for furniture, Duane can sort through his log pile or look for downed trees until he finds one that meets his needs. On the way to his shop, he suddenly pulled over and pointed to a huge sycamore tree that had fallen when a stream bank caved in. We crawled through a barbed wire fence and walked over to it. I could see that he was already mentally quartersawing it for some future project. Duane said that if he and his neighbor can reach an agreement, logs from that sycamore will soon join the others at the mill. The LumberMate is a manual mill, but Duane uses a John Deere 2020 tractor for loading the log, and the tractor forks make a handy place to stack the lumber. He sees pushing the blade through the wood by hand as an advantage. “It lets me feel how the blade is cutting. I usually slow down when going through a knot or cutting wide boards. When it takes more push than it should, I know the blade is getting dull and ready to be changed.” He pushes the mill’s 31-inch maximum-log-diameter capability by slabbing the sides of bigger logs with a chain saw. While these logs push the limit of both man and machine, he finds the results are generally well worth the effort. “You can’t just go out and buy lumber like this,” he noted as he loaded a 22-inch-wide walnut slab on the forks of his tractor. After milling, Duane air dries the lumber for three to six months, depending on the species, thickness, and the weather. When he is ready to use it, he takes it to a local Amish woodworker who has a wood-fired kiln to finish drying the wood to 6%. Other than the kiln drying, Duane has total control over every aspect of the wood from selecting the log to buffing out the final coat of varnish. “Diversity remains critical to my staying in business— at any given time, there are usually one or two aspects of my business producing cash flow,” says Duane. He has a standing order to supply yellow poplar boards for technology education programs in area schools. In addition to woodworking, he performs as a solo singer/guitar player at weddings, parties, and at some of the local watering holes. 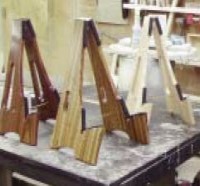 The desire for a more attractive place to set his guitar during gig breaks, led to the development of his Slay-Frame guitar stand—a folding guitar stand which he designed, patented, and now sells worldwide (www.slayframe.com). He noted that this product keeps him particularly busy around Christmastime. Though he has thought about expanding, Duane plans to stay a one-man business. “I like working by myself and not having to worry about what the guys will be doing if I show up late, making sure that they’re not goofing off, how I’m going to pay them, or doing all the paperwork.” He does not want to lose his personal connection with his clients. “All they have to do is call or e-mail me. No extensions, no holding while a call is being transferred. That personal touch was something I learned at a veryearly age, and I carried it through. I would risk losing that if the shop grows too much,” he explained. Get an overview of our products and view Norwood sawmills and forestry equipment in action. You prefer getting the electronic catalog for your phone or tablet, download it here.